James William Dean, 77, died peacefully on November 13, 2017 at his home in Raleigh, N.C. He was born May 2, 1940 in Fort Oglethorpe, Ga., the son of Margaret Geneva Brown Dean and William Graham Dean, and lived most of his early life in Roanoke Rapids and Woodland, NC. This time, spent with his grandparents, parents and brothers, was special for Jim and formed his unique approach to life. Jim graduated from Roanoke Rapids High School in 1958 and then attended the Virginia Military Institute graduating in 1962. He was commissioned in the US Army and was stationed at Fort Holabird in Baltimore MD where he met and married Diana L. Barsotti. They had two children, Scott and Susan. 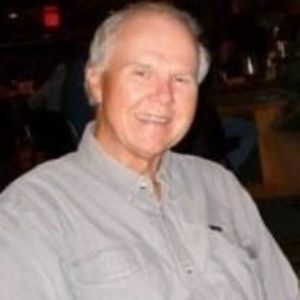 After a brief time living in Graham, NC working as a sports and outdoor writer for the Burlington Times News, the family moved to Raleigh, NC in 1970 where he began his career at the NC Wildlife Resources Commission as a writer and photographer. In January 1978 he penned his first "Our Natural Heritage" column and in 1979 became editor until his retirement in 1998. In addition, he was a freelance writer for "Field and Stream", "Outdoor Life", "Sports Afield", "Fly Fisherman", "Fly Rod and Reel" to name a few. He also authored two books; "The Secret Lives of Fishermen" and "Dogs That Point, Fish That Bite". He continued to write and publish until his death and had begun work on a blog that could reach more people to share the stories he so dearly loved. Jim was a true "renaissance" man-he loved the outdoors, art, all types of music, fishing, hunting, sailing, good food and wine, painting, was a voracious reader and became a winning amateur poker player. He spent many enjoyable hours with close friends and family at the family farm in Oxford, NC, the family beach house in Emerald Isle, NC and fly fishing the Henry's Fork River in Last Chance, ID and the various creeks and streams in Western NC, most notably Wilson Creek. Jim was also a staunch conservationist and instrumental in protecting wildlife and its natural resources. Jim had a gift for making dear friends wherever he went. He was quick to laugh, adventurous, sentimental, interested and willing to try new things, witty, loved reminiscing, and always, always sharing stories.that was his real gift. But it was his role as son, brother, father and grandfather that will leave the most lasting legacy.he was our best friend, mentor, and beloved father who taught us goodness in all things. Jim was a "happy little soul" who left us too early. He is survived by his son Scott F. Dean and wife Nicole R. Upah of Wilmington, NC; daughter Susan Dean Richardson and husband Thomas H. Richardson of Weems, VA, granddaughter Hannah G. Richardson and grandson John W. Richardson; brothers Graham E. Dean and wife Sandra of Cape Carteret, NC and John W. Dean and wife Beth of Valle Crucis, NC; niece Shannon Dean Daly and children Thomas and Graham of Richmond, VA; niece Jenna R. Dean of Cedar Point, NC, niece Jessie Dean Caulfield and husband Barney and children Sam and Emma of Ashville, NC, niece Melissa E. Dean of Ashville, NC. A visitation will be held from 5:00-7:00pm on Friday, December 8th at Brown-Wynne Funeral Home, 300 St. Mary's Street, Raleigh. A private service will be held at a later date. In lieu of flowers, donations can be made to the NC Wildlife Endowment Fund www.ncwildlife.org/Give-Donate/Wildlife-Endowment-fund or the Henry's Fork Foundation www.henrysfork.org.